The United legend was highly critical of what he perceives as a culture of self-obsession. Alex Oxlade-Chamberlain was on target as Arsenal beat Chelsea at the weekend. ALEX OXLADE-CHAMBERLAIN has responded to claims by Roy Keane that Arsenal’s players are more interested in selfies and six-packs than winning trophies. Keane was highly critical of what he perceives as a culture of self-obsession among Arsene Wenger’s squad. The former Manchester United captain, who now works as Republic of Ireland assistant boss, claims a lack of focus on playing matters will once again stop Arsenal winning a first English title since 2004. But the Gunners made a statement of intent on Sunday when they defeated champions Chelsea 1-0 in the Community Shield thanks to a fine goal from England midfielder Oxlade-Chamberlain. 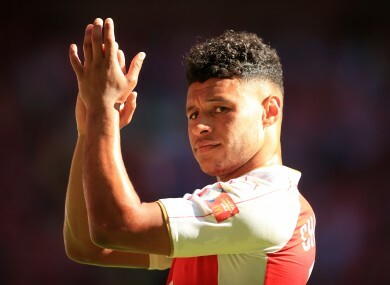 And, while the 21-year-old accepts many of Arsenal’s players are all fully immersed in the modern social media culture, Oxlade-Chamberlain insists that does not make them any less determined to deliver on the pitch this season. When asked about Keane’s comments, Oxlade-Chamberlain said: “It is a new era, isn’t it? Some people do it, some don’t. We are serious about winning trophies. “Personally, and I can speak for the rest of the squad, we have been serious every single year I have been at the club about winning trophies. “You can see that on the pitch when we are playing, through the season. “A lot of people don’t see when we lose and go through tough times how upset and disappointed we are. Email “The Ox hits back at Roy Keane's selfie jibes”. Feedback on “The Ox hits back at Roy Keane's selfie jibes”.